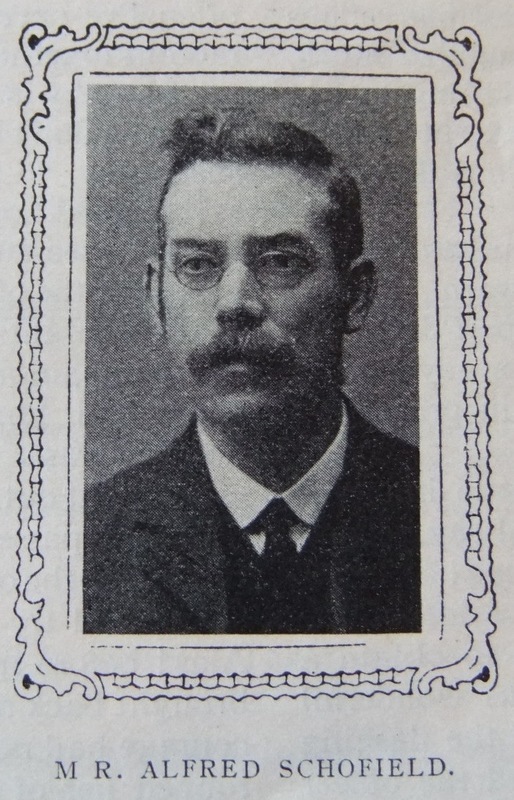 MR. ALFRED SCHOFIELD, the senior steward of Walmersley Road Society, Bury, is a typical Lancastrian, brusque in manner, rapid in speech, and keenly alert in business. He was converted when a boy and immediately joined the church and became actively interested in its welfare. His first experiences of the Quarterly Meeting were not of a pleasing character, and he mentally resolved to go no more. His, however, is a nature that cannot be satisfied with seclusion, and though he has not forgotten the unfavourable impression of his first contact with official life, the dismay he then felt has long since passed away; and he can now enter into a spirited debate with relish and positive enjoyment. A surface study of our friend does not commend him to favour. In the District Committee for instance he appears critical and censorious, but these traits are the defects of his qualities. He requires to be known, and to know him is to respect him. He is a tireless worker, impatient with drones, and likes to see everything in full swing. He is a diligent Sunday school teacher and prepares his lessons with thought and prayer. He has been Trust treasurer for fourteen years, during which time large sums of money have passed his hands and his methodical book-keeping and painstaking attention have won him high praise. A Vice-President of the C.E., he is the first to pray in the Sunday night prayer meeting, and every week he visits a few sick and aged poor. He is a liberal giver, and is sympathetically supported by his wife in every good work. He has a very kindly heart, an open hand and a pocket easily accessible, and often by stealth he brightens the lot of the widow and fatherless. The subject of this sketch was probably Alfred Schofield born in 1864 at Ramsbottom, Lancashire, to parents Jonathan and Elizabeth. Jonathan was a railway platelayer. Census returns identify the following occupations for Alfred. 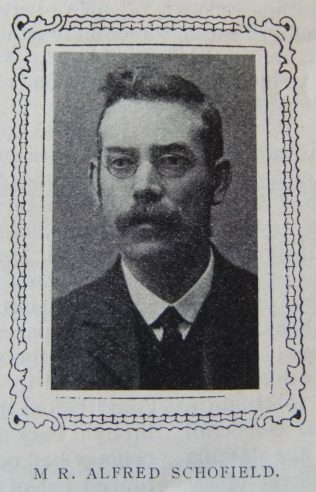 Alfred married Mary Alice Greenhalgh (abt1870-1951) in early 1896 at Bury, Lancashire. Census returns identify one child. Alfred died on 1 January 1942 at Bury Infirmary, Lancashire.